As I get used to the weather here and try to understand which fruits and vegetables are actually in season right now, I realize how tuned in my body is to the cycles of a Minnesota year. Right now, I would be readying myself for months of sweaters, wool socks, root vegetables and hearty soups. I would be anticipating breakfast and dinner in the darkness and slippers around the house. Instead, I am barefoot all day (although this is considered quite unusual to Argentinians, who always wear shoes) and weary from the heat, and I am craving crisp salads and cold drinks. Because the fruit and vegetables markets carry produce from throughout Argentina which is an enormous country, I am still unclear exactly what constitutes local or regional food in Mendoza, or where it all comes from (not to mention what chemicals are on it). 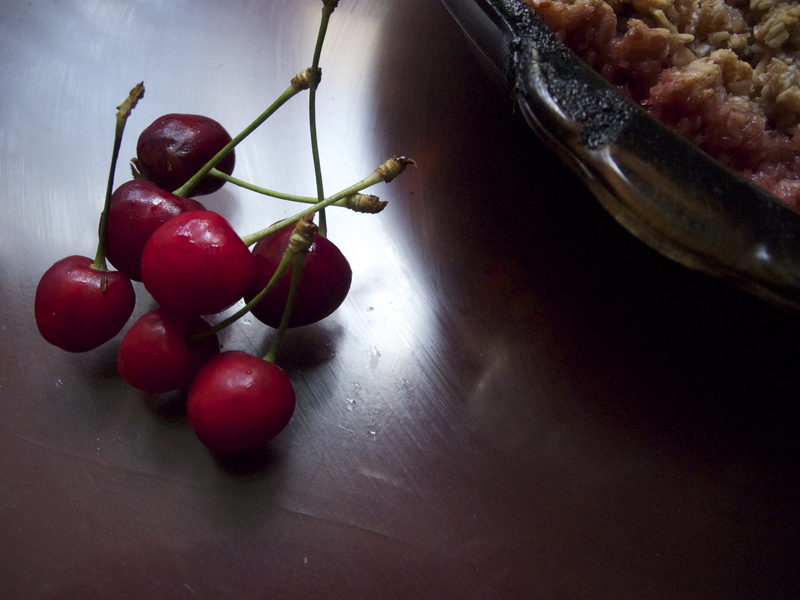 That said, I did find some tart spring cherries in the organic market last week. As I watched a toddler chew on them and bright red juice dripped down his face, I realized that this was a treat not to be missed. Of course, what better way to enjoy them than in a fresh fruit crisp. 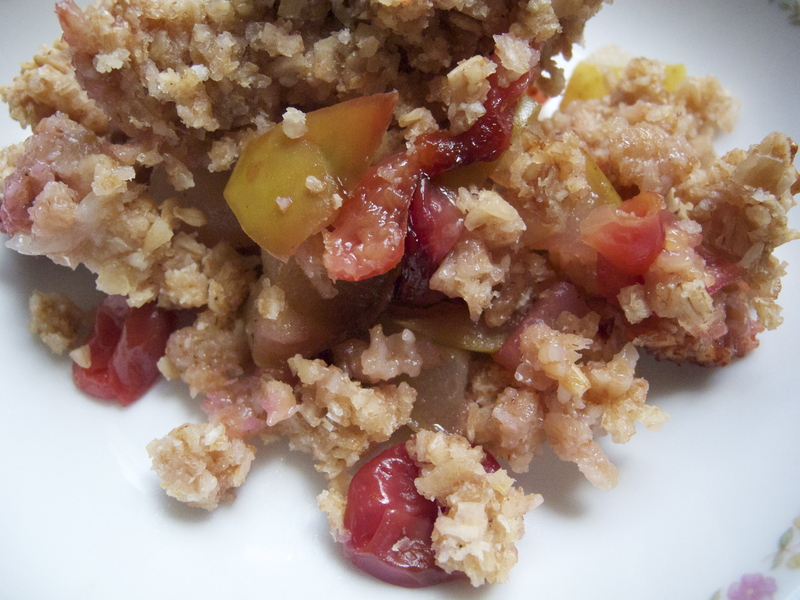 This was a simple mixture of apples (granny smith), pears and cherries, cooked with a little sugar and a orange juice. 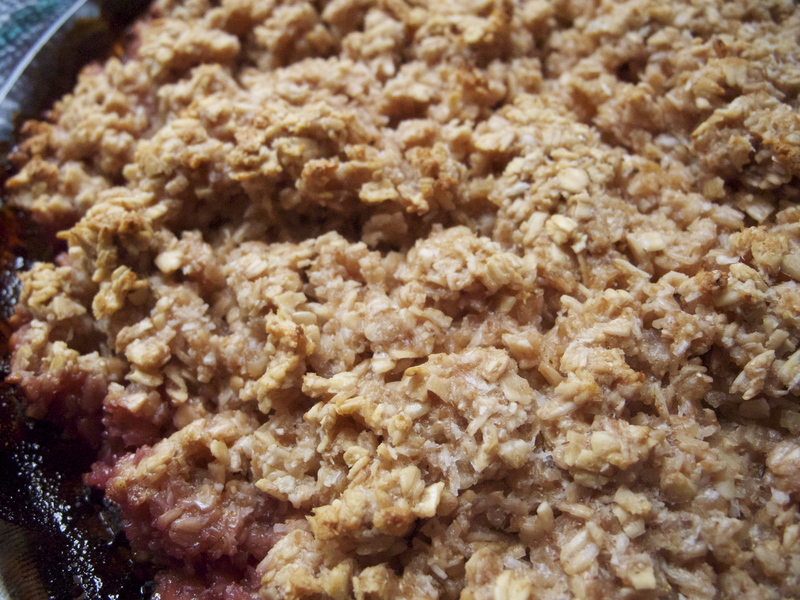 The topping combined oats, whole wheat flour, sugar and the liquid created from cooking down the fruit A last minute added touch was shredded coconut and coconut milk. It was simple, delicate and delicious, and disappeared before I got a second piece! In a saucepan over low heat, cook the juice/sugar, fruit and vanilla. Start with the chopped apples or other stone fruits and simmer for 5 to 10 minutes. If you’re using berries, add these now and continue to simmer on very low heat for another 10 minutes until very thick and sweet smelling. While the filling cooks, in a separate bowl combine the oats, butter or oil, juice, sugar, flour, salt, and cinnamon. The dough should be moist, but still slightly crumbly. If it is too wet, add more oats and if it is too dry add more liquid. Pour fruit into a 9 by 9 baking pan and sprinkle and dab the dough on top of fruit. Cover the pan with foil and bake at 375 degrees for about 20 minutes. Remove foil and bake another 5 to 10 minutes until browned.